If you have a thing for chocolate, the world is your oyster. On this very site, 86 of the just over 800 recipes boast a significant chocolate component and entire sections of bookstores will be happy to fill in any cravings I missed. If you have a thing for bacon, the internet would be overjoyed to find you places to put it, zillions, even, although I’d proceed with caution before auditioning a couple. But if you have a thing for something slightly less of a prom king/queen ingredient, say, tiny white beans, well, it can be tough. It’s not there are no uses for them, it’s just that when you’re very much in love, there are never enough ways to be together. And if you’re me — someone who sometimes ups and makes a mega-pot of white beans just because you feel like it, presuming you’ll find things to do with them later — you sometimes end up scrambling, yanking down nearly every cookbook in your collection but still coming up bereft of uses outside the well-trodden soup-and-salad territory. So tell me: What are you favorite uses for beans outside the ever-popular realm of chili, tacos, soup and salad? Really, I’m hankering for more inspiration. I ended up finding some — but never enough — in this month’s Bon Appetit, in a stack of pasta recipes you will find it impossible to choose among from Sara Jenkins of Porchetta and Porsena (and green bean salad, sigh) fame. I was so charmed by the short tubes of pasta with chickpeas, I made it almost immediately but maybe it was because I’ve overdone it on chickpeas this month, but I kept thinking it would be nice with something… daintier. And considering that it is an established fact (um, in Italy, where I suspect both my white bean and artichoke obsessions could roam free) that white beans, garlic, rosemary and olive oil are a combination sent from above, I had a hunch they’d be happy here too. The result is a great pasta for this time of year, deeply comforting and hearty but not overly decadent. There’s no heavy cream or cheese, or dairy at all; there’s no bacon (I’m sorry) or even a pinch of meat. And you won’t miss any of these things because, like a certain soup I have missed immensely since last week, it’s the finish that makes the dish — in this case, a sizzling oil with not just garlic but freshly minced rosemary too. If you finish that with a few pinches of sea salt, oh boy. You’ll see. It’ll make a convert out of you too. Book Tour II: Just in case your missed the announcement a couple weeks ago, The Smitten Kitchen Book Tour marches on in February and March, with eight cities (hello, Atlanta/St.Louis/Minneapolis/Salt Lake/Denver/Raleigh/Montreal! plus an additional, awesome event in Brooklyn). I hope this means we finally get to meet. For the pasta, I used pennete, because I thought it nicely matched the little white beans (Rancho Gordo’s Alubia Blanca). Sara Jenkins called for ditalini to go with chickpeas. You can use whatever you’d like — short tubes, even elbows, and canned beans are just fine here. I streamlined the recipe a bit to reduce the number of bowls and pots used, because I’m having the kind of week where if I see another dirty dish, I’ma run far away ahem, to make things easier. This makes a lot of pasta, because you’re using a whole pound plus two cans of beans, so it’s a great recipe to consider halving if you wish to finish it before spring comes. I love white beans! Have you tried making it into a “bummus” as in hummus but with beans. It’s delicious! This is perfect for my friend who’s on a 60 day vegan challenge, I’m defiantly going to forwarding this to her!! Yum! My mom also makes a white bean pasta that is to die for, and perfect for this time of year. I’ve been loving cannellini beans in dips recently. So creamy! I’ve been making a lot of soups lately, but this seems like a wonderful alternative for the grey Connecticut winter. As always, thanks for the great ideas! I second Mandy- I made impromptu black bean hummus recently and it was so delicious. Super healthy too and very very easy to make. This may be sacrilege, but any suggestions for what herb could I use in place of the rosemary? I’m allergic–and although this recipe looks delicious, I don’t think it’s worth my throat swelling shut. Thanks! This is very close to the pasta fagioli recipe my mum and nonna make, so you could try what they do and add dried oregano to flavour the beans when they’re half-way cooked. I’m not sure how it would go with the garlic (I’d try fresh oregano if you can find it), however fried garlic has so much flavour I think it would be fine if you left the rosemary out all together. This sounds lovely – and thank you, THANK YOU for not including sausage and escarole/kale… Lately, I keep running into the same old things paired w/white beans. I already know I like it *that* way! This sounds YUMMY. I have everything, think I’ll make it this weekend. This sounds really filling and economical. I do think I will halve it, though, as it’s just my husband and I and he won’t be super excited about no meat. I have this thing I like to do with white beans. It’s a really nice side dish or meal with rice. Take a can of white beans and rinse and drain them. Melt about a tablespoon of butter in a small skillet and saute a shallot for a minute or so. Add the beans. Cook until beans are hot and butter is just beginning to brown. Stir in a tablespoon of red wine vinegar and a little more butter to make a sauce. Finish with parsley. It’s really good. I store white beans and pinto beans but usually the only thing I can come up with for white beans is white chicken chili…so thanks for another use…looks delicious! I love white beans (and chickpeas). Adding them to pasta? Best idea of the week, thus far. My husband’s preferred way of serving white beans is to add them to a saute of broccoli rabe, lots of good olive oil, garlic, onion, red pepper flakes, and salt (with some chicken or veggie stock to loosen it all up). Parmesan grated on top at the last minute, naturally. The texture of the beans contrasts nicely with the rabe. A hearty side dish, and when served with a big chunk of rustic bread and glass of red wine, a pretty satisfying dinner. Jess — Love the idea! Thank you. I love white beans, and then you added rosemary – yes please! There is a white bean and chicken breast recipe, I thought it was yours, that we enjoy, also I’ve just made a pot of pork hocks and white beans from Emeril’s recipe that is extremely good. I made it with canary beans I found in a Mexican store and they are super creamy. I need to get more so I can give your recipe a try. Hi Deb! First off, I have to say that I just LOVE your spaghetti squash tacos. They’re so darn good and my kids and skeptic hubby loved them as well. We’re not huge spaghetti squash fans when it comes to being a pasta substitute, (we love our carbs) but for tacos, YES! I actually just posted the recipe on my blog yesterday. I just love your cookbook and I love the way your personality shines through as well. You rock! I love white beans. Since you asked (I think) here are two recipes I have enjoyed. I know one is a salad but I think it is a different set of flavors from the standard white bean salad and really delicious. I love white beans! My go-tos are generally soup and salad (like you mentioned), but I also love throwing them into Indian Food dishes that normally call for chickpeas. Love the idea of this pasta – especially with the garlic/rosemary oil – looks divine! That looks really good – warm and filling but not too heavy. I attended a dinner group last night with friends. The theme was French Food, and I was assigned a side dish. I made Boulangerie Potatoes (note: they take a long time. Dinner was delayed and they were in the oven for 4 hours and were heavenly!). I was inspired by a dish Marc Bittman includes in “How to Cook Everything” that he calls “Bean and Potato Gratin”. It calls for small white beans, chicken stock, thyme, and potatoes, and is inspired by boulangerie potatoes. We found the flavor on his is lovely but I think there is not enough stock as the potatoes were soft but dry. This looks like the perfect simple vegetarian dish – always on the lookout for great pasta & bean recipes. As far as bean ideas go, I like mashing white beans with garlic, olive oil, lemon, and kosher salt a’la Nigella. Sprouted kitchen cookbook has a really tasty braised white beans and leeks with mozzarella on top. Delicious. I add the garlic after the sausages and then add kale at the end. Yum. Love white beans. I find that I make them often the way Jess described (sometimes mixed with sausage & orrechiette- because they serve as a nice cradle!) or as a side with braised romaine. I also have pureed them for composed plates at restaurants in the past, sometimes with garlic/rosemary… and unforgettably with chamomile cream for another dish. Your dish looks great! This is making my mouth water! Thank you so much for posting a plant-based recipe; I can’t wait to make this! As for white bean recipes, have you looked into baking with white beans? There are white bean blondie recipes, and white bean cookie pies that are magic and amazing. 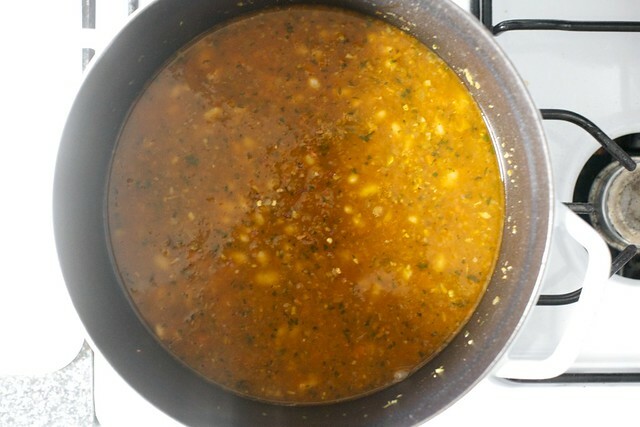 A variation of pasta fagioli, made with white beans, chicken stock, and spaghetti and then seasoned with mint. Oh, and I never made it, but I love white bean pie. I’ve had it with different crusts, and I think the filling is just mashed white beans, ground almonds, eggs and sugar. I make a similar take on this dish where I cook the pasta right in with the tomato paste broth and let it reduce. Then I thicken it up with goat cheese. It fulfills the craving for cheesy, creamy pasta without going too overboard. I love pasta and beans/lentils together! Will make this these days, hope you find inspiration about beans (and hopefully lentils, since I love those even more) and share them with us soon! I am definitely going to try this recipe. I grew up on Escarole & Beans..or as my fellow Eye-talians say, E’scrawl & Beans. My Grandmother would have used the tiny square-shaped egg pasta for this. I cannot find it anymore *sigh*. I too love white beans and have made them a few ways recently. White beans sauteed with some celery and carrots (in a little butter and herbs) makes a great side for anything, though most recently your gnocchi + tomato broth. White beans + celery is one of my favorite combinations. 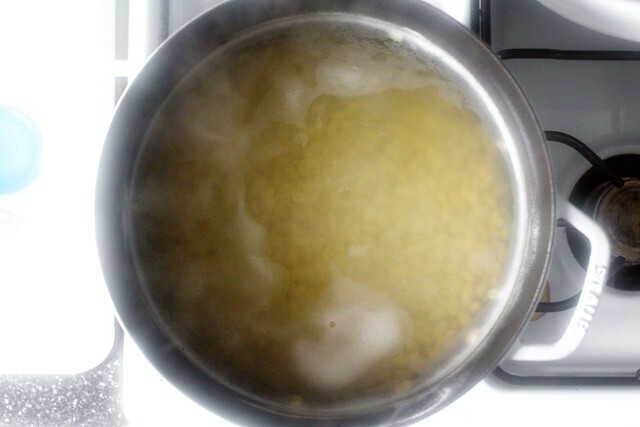 I make white beans and celery in broth (with some garlic and olive oil) and serve over bulgar. I also made soup the other day (I know, everyone has) with chicken sausage, white beans, fire roasted tomatoes, and spinach that was really fantastic. I’ve been a vegetarian for more than 20 years, and I’m still in soup, salad, and spreads for my beans. Though I bet that if you made a lemon, white bean, artichoke spread that you could use it to make an awesome stuffed bread. I’ll have to try it and let you know. I’ve had black bean cakes (served over a salad but also made thick enough to be used as a burger patty). Could you make such cakes with other beans? Yum! This looks delicious. I’m always on the lookout for a recipe that my vegetarian self and meat-loving boyfriend can both enjoy, and this looks absolutely perfect. I can’t wait to try it! White beans are my favorite! I like to sautee them with some spinach and garlic/hot pepper/lemon juice. But I think this recipe is going to be a staple in my rotation. Thanks so much for sharing! I love white beans, as well, and I like to use them lately in various curries or Indian dishes – and I know you’ve been into Indian cuisine for a while, so you probably already know that. I’ve also been on the lookout for a good white bean recipe and once I find something, I’ll let you know. Your dish looks marvelous: white beans almost become one with short pasta: they both look so uniform. Toss beans and chopped onion with olive oil. Include garlic paste if you want. Spread in a not-too-thick layer, usually in a cast-iron skillet. Season sprinkle with salt and what seems to be ridiculous amounts of black pepper. Bake (anywhere from 350-425) until the beans are browned. The original recipe came from an Arabian cookbook, and used chickpeas, which I think are even better in this than white beans, but white beans are pretty good. When I don’t have anything else in the house to make for lunch (and sometimes even when I do), I like to combine a grain (any grain, but rice and quinoa are fastest and therefore my go-to), white beans, and one shallot (or 1/4 onion), deep fried until crunchy. I occasionally add a tiny bit of butter, and either salt or a bit of soy sauce, and that’s it. It’s the fried shallot that really elevates things, but creamy white beans play a key role. It’s dead-easy, simple and not particularly visually attractive, but I can eat it once a week and be happy to do so. I am completely and utterly in love with this dish. This was a particularly adorable Jacob-ism. Well played, mama! When you are ready to revisit the might chickpea, might I suggest whole wheat spaghetti tossed with ribbons of cabbage, chili flake, chickpeas, and sage and finished with a Romano style cheese? Though my absolute FAVORITE thing for little white beans is to braise them with escarole. A simple main with a hunk of bread and red wine. It’s good stuff. Canal House has a nice “recipe” but you could make it up as you go, which I usually do. Otherwise- tacos, curries, spreads, in stir-fries (little white beans would be so good stir fried with broccoli, garlic and chili sauce or something like that). Or scrambled with eggs (in the case of black beans or pintos), then tossed with herbs and splashed with hot sauce. Also, pureeing them into cakes and brownies should not be overlooked. Sounds weird, but is oddly delightful. Go beans! And lentils! Hooray! this is my first time writing in, Deb, I love all your recipes and really appreciate that you have a whole gluten free section, I will be making those GF oreo cookies in the next week! Just a comment to Katie, with the rosemary allergy, I would think that thyme would work here nicely, it’s another hearty winter herb, but I think you could use almost anything…that’s the great thing about recipes (guidelines, not rules), use what you like! Oh boy! This is perfect. I was just thinking about the pound of little white beans sitting in my cupboard. Now I know what I will be simmering on my stove later this week. Thank you! It’s funny because we had something very similar last night. I like the idea of rosemary, though. One thing I love with white beans is to make bruschetta. It’s my interpretation of an appetizer I’ve had at a restaurant near Chicago. Toast a few chopped cloves garlic in olive oil and add one pint of chopped fresh tomatoes seasoning with salt and pepper (I use grape tomatoes when tomatoes aren’t in season). Once the tomatoes cook down some, add one to two cups cooked white beans and heat through. Add about a half pound of clean fresh spinach and toss until wilted. Spoon mixture onto good toast, sprinkle with grated cheese and chopped basil (although, I bet rosemary would be good too) and serve. I like this as a weekend lunch as well as an appetizer. -Soak 1 lb. or 500 gr. of beans overnight or all day. -Sofrito of 1 big onion and 5 cloves garlic in olive oil-a bit of diced jamon (recommended) or bacon optional. Or maybe you have a jam bone lying around-just checking? -Add beans, nestle in a few smoked Spanish chorizos (or regular good pork sausage+teaspoon or two of smoked Spanish paprika to make up for it). A few whole carrots, peeled. Heaped teaspoon of thyme + teaspoon of smoked paprika. 2 bay leaves. Salt added near end! -Add filtered water or soft water to cover + two fingers. -Cook on low simmer (or slowcooker) until almost tender. Add salt to taste and then add 2 Spanish Morcilla sausages (blood sausage) if you have it. If not, well, no worries. Add more thyme or paprika if you think it needs kick. The beans should have some liquid and be a bit soupy. 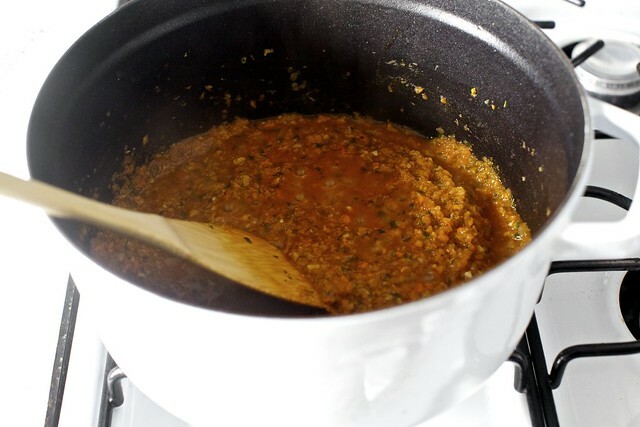 -just before serving, blend carrots with a bit of broth and a heaped tablespoon of beans and stir gently back in. – eat with a big spoon and serve with thick bread, a green salad or a tomato/cucumber salad, fruit for dessert. -Take a long walk, climb a mountain, build a barn, etc.. I love white beans cooked with garlic and lots of sage. Then I drain them and season with salt and pepper and flavorful olive oil. Hi Deb! I love your site, and this is my first time commenting. We have a go-to white bean recipe that is similar to some I see here. It’s basically white beans and fennel in whatever proportion you like (I do a bulb of fennel to 1.5 cups beans), dressed with lemon, olive oil and dill, and then topped with feta cheese, toasted almonds, and green onion. A bit of sea salt and fresh pepper, and it’s about as good as it gets, and a bit more substantial than the usual salad. This looks like just the right dish I need to make next and blog about. Yum! Another easy delicious way to use small white beans is in a slow braise with an inexpensive pork roast on top. In a Dutch oven, I barely cover the beans in liquid (good stock or broth and some white wine), and simply season with bay leaves, fresh thyme or whatever you’d like. Throw in some chopped garlic, onions and celery, or not if you’re feeling lazy, and plunk a nicely seasoned, inexpensive pork roast on top. Bring it all to a simmer on top of the stove and then braise it, covered in a 300 degree F. oven for several hours until the beans are creamy delicious and the pork is done. What could be easier! This looks incredible! I’m adding it to this list of dinners I need to make. A fun (and EASY) way to use white beans is on mini tortilla pizzas. Here’s my recipe: http://yellebellyboo.blogspot.com/2012/01/tortilla-pizzas.html I think even your little one would like these (although I bet in your household he isn’t a picky eater)! I am slowly becoming a bean convert. Beans are really the only food I have disliked since day 1, primarly due to texture. Slowly, I am working my way up. I tried chickpeas a few years ago, and loved them (my gateway bean). Lentils were next. I know those aren’t really a bean, but it is a similar texture. Love those too. And last weekend, I tried cannellini beans….in your Pancetta, White Bean, and Chard Pot Pie from the book. The instant I saw it in your book, I knew that was the way to try the next bean, and I was right. That recipe is amazing. I guess the grown up version of me likes beans after all! Thanks! I love making your roasted tomato and cippoli dish, but instead of piling them onto drained cans of beans, mashing the beans with roasted garlic and making the whole thing into sandwiches. Cannot wait to try this recipe, thanks!! My favorite go-to bean recipe is to simply warm up a can or two of garbanzo beans. Pull them off the stove and toss in 2 cans of good quality tuna packed in olive oil, zest of one whole lemon, juice of the lemon, finely chopped rosemary (or mint or sage, I’ve used them as well) to taste and a few glugs of very good olive oil to pull it all together. Really good warm. Forgot to add that dill works beautifully, too. I love white beans and eat them several times a week. My favorite way to eat them is as a bruschetta topping – I mix white beans with white balsamic vinegar and thyme, sometimes adding chopped grape tomatoes, sometimes red onion, or whatever other veg I have lying around that seems like it would be good. Toast bread, rub with garlic, top with goat cheese if I have it, top with bean mixture. Sometimes I drizzle with olive oil too. Delicious and healthy! I’ve also been making a spicy baked beans dish lately – cook up onions, a bit of a tomato based sauce (I use my homemade pizza sauce because I always have some leftover after making pizza but you could use whatever), a tsp or 2 of adobo sauce or a small chipotle pepper chopped up, mix with already cooked beans (I use white or black, depending on what I have, but any could really work), add a handful of finely chopped greens and some grated cheese (again, any kind you like). Top with more grated cheese and maybe some breadcrumbs and bake until heated through. That is somewhat loosely adapted from a baked bean recipe from Heidi at 101 Cookbooks. I know rosemary is a traditional herb with white beans, but I find I prefer thyme – it doesn’t overpower the way rosemary can. Love the simplicity of this dish. Fresh ingredients done well. My husband is a bean-hater (it’s terrible, I know), so I can’t get enough beans. White, black, red, whatever! I’d be perfectly content to just eat a bowl of beans. I’ll have to try this when he’s off somewhere being lame, not eating beans. I make a chocolate cake with white beans, a lot of walnuts and no butter. It has a great texture, a bit crunchy. Everyone likes it. How the heck did you know I cooked a big pot of white beans last night?? Now you make us read all the way through the recipes to find all your “funnies”??? You are amazing, and your sense of humor is one of my favorite things about this blog. I am truly LOL-ing as I type. “I’ma” make-a these beans soon.. ( when I can stop laughing), your best one since “Blogga please” hahahahaha… you slay me. This looks delicious but I’m anti-parsley. Would it still work if I leave it out or do you have a replacement suggestion? P.S. I am merrily cooking my way through your book. I think I’ve made the breakfast crisp half a dozen times. Thank you! Artichoke-White Bean Dip: Can of white beans, can of artichokes (both drained), puree with garlic, olive oil, lemon juice, fresh rosemary, S&P — couldn’t be easier. Great with pita or veggies, or as a sandwich spread. I sprinkle a little smoked paprika on before serving sometimes. Another delicious pasta with white beans…saute garlic, rosemary, crushed red pepper in lots of fruity olive oil just until garlic releases its fragrance. Toss with pasta, white beans, feta, kalamata olives, & a little of the pasta water if needed. Top with fried sage & freshly grated parm. This for when you can’t even be bothered to wash the food processor! Katie (#7) – we make a pasta with white beans that has basil as its flavoring, maybe you could try that? What are “little white beans”? What do I look for in the grocery store? My kid loves what we call creamy beans: after you cook your white beans, put some of them in a separate small pot with a bit of bean liquid and a crazy amount of olive oil. Cook on low, stirring, until they get creamy. Salt, and maybe pepper, if you are into that. As a base for some perfect, fruity tomatoes in summer, or a fried zucchini flower, or alongside some braised bitter greens. I also sometimes pair them with your chicken meatballs. Muy popular. My sister lets her beans cook gently, for a long time until they just on the verge of breaking up. She then mixes al dente pasta into the undrained pot of beans, adds a good slug of olive oil (sometimes also torn basil leaves) and then she adds another drizzle of olive oil when serving. It’s creamy, tasty and unforgettable. It is so easy and delicious that we eat it every few weeks. I think I sub in your recipe next time for a change of pace. What a great bowl of warming, comforting, good looking food. This would be an automatic win with my family. Even those who don’t ‘love’ beans could get on board with the rosemary oil added…mmm! Oh yeah, in the spring and summer I do white beans with a million herbs, because I have a big herb garden. This is, I think, a Deb Madison extract. Add the herbs, chopped or minced, depending on which herbs you have and whom you are serving, to the hot beans just before serving. So fragrant. Serve with garlic toasts. People are always impressed. It works with smaller white beans, too, and it’s a nice change of pace from your usual bean salad or side dish. A dietitian friend of mine came up with a recipe wherein she sautees white beans in olive oil and garlic until they’re cooked and a little crispy and then mixes them in with some wilted arugula and puts it all on bruschetta. Not too shabs. I actually made a pasta dish last week, sort of inspired by that soup you miss so much, with sausage, kale and white beans in a light tomato sauce. I was rather impressed with my handiwork until my husband reminded me it was basically “dried up pasta fagiole” (mind you that was after his second helping, so I guess it wasn’t so bad). Full disclosure: my husband actually calls me “cannellini beanie” sometimes because I love them so much. Another white bean-lover here! I love to make bean soup and also toss it with broccolini or broccoli rabe along with garlic, olive oil and red pepper flakes. Once in a while, I’ll make a bean dip but keeping it simple, I often just warm it up with some garlic and oil as a side. I’ve been thinking about adding some beans to bulk up pasta and this sounds delish! Thank you: this was dinner tonight moments after you posted (European time zone)! Trifecta of wondering what to make, this recipe popping up on my feed reader, and having all the ingredients on hand. Plus, interesting enough techniques that I was curious (processing the sofrito, and the garlic rosemary oil) and easy enough that I could make it quickly. I did substitute celery leaves for the parsley, and 3/4 of a can of diced tomatoes instead of tomato paste (and less 1 cup water). I made it with small shells, which were just right to scoop up the sauce and shelter a bean cutely. Yum! My 3-yr-old didn’t eat it, as I hoped he might, since he loves pasta and used to love beans, but he’s entering a picky phase, gahdarnit. One note: you specify to save 1 1/2 cups of pasta water, but only have 1/2 added in later. I suppose the extra is in case it needs more to loosen up, but there’s no mention of that, so I did momentarily wonder if one or the other is a typo. Oh, and I meant to mention that I was SO SO excited to get your cookbook for Christmas! I’ve been dying for it but had to wait until we flew to the US to get it, anyway, so I put it on my wish list. Can’t wait to do lots more cooking with your lovely recipes! I love white beans too and i am obsessed withe the white bean and prosciutto salad at le pain quotidien – has an amazing pesto vinaigrette over it. I’ve seen it recreated on a few food blogs and its an awesome fix for if you crave white beans. Beans with pasta is one of my culinary mental blocks, but I should give this one a try. We make an edited version of 101 Cookbooks’ Giant Chipotle White Beans fairly often (http://www.101cookbooks.com/archives/giant-chipotle-white-beans-recipe.html), skipping the cilantro pesto. It hits a lot of the nice winter-food notes: hot from the oven, a little spicy, solid but not leaden. I was at a dinner party a few years ago where the appetizer served was a white bean and avocado dip flavored with garlic, lime, salt, and cilantro served up with pita chips. I nearly spoiled my dinner as I just couldn’t get enough! I start with two avocado and one can of white beans then play with the flavor ratios according to my whims when I make it at home, and especially like to add a little hot sauce when I’m in the mood. I don’t think I have made traditional guacamole since. Yay! Just when I’ve been agonizing over what to serve my vegan dinner guests next week (yes, I agonize about these things at least a week ahead of schedule), other than my go-to vegan avocado lemon pesto, which right now seems a little too… summery. This recipe is perfect! Thank you! Also since you mentioned these white beans as a chickpea substitute, it made me think that they’d be good in Tabbouleh (which, I know, falls into the general Salad category and is thus not very original). I wonder if they’d also work in a Spanish Omelette / fritatta type of situation? This looks great! I love white beans too! A staple recipe of mine is to mix a can of rotel, a can of white beans, toss with a pound of pasta and top with feta. Packaged up it makes a yummy lunch at work. Maybe you can come up with a less “canned” and healthier more flavorful version for me! Everyday Food has a couple of great tuna and white bean bruschetta type things that we love. I also like a Jamie Oliver recipe from his Italy book that sautes garlic and rosemary (or other herbs) together, then mash in some white beans, add a glug of vinegar and smear on toasted bread. I never liked white beans until I found myself in a restaurant in Florence called Fagiole. Every table was ordering these amazing looking white beans so I had to try them. Of course, they were amazing. I still don’t think most places stateside have any idea how to cook them, but for my money the best thing to do with white beans is to saute them with olive oil and lots of garlic and eat them as is. I don’t think more is required. I Love the idea of beans with pasta! A complete vegetarian protein. I love, love beans. My bean eating is only inhibited by my husband’s, ahem, digestive problems with beans. In an otherwise mediocre cookbook on Mediterranean soups, I found a great and simple recipe for a hearty bean and tomato soup that is really more like a stew that I make all the time. I miss tomatoes in the winter so I like that I can use canned tomatoes and sundried tomatoes with great results. I have used all sorts of beans in a pinch but white beans are my favorite. Dice white parts of leeks and red onions (very course and loose is fine). Cook in a few T olive oil for ten minutes, allowing them to soften but not brown. Add garlic and cook 1-2 minutes. Finely chop softened sundried tomatoes (I use dried tomatoes so I throw in the water I use to soften then for broth). Add these and canned tomatoes, beans and broth to onion and leeks. Simmer for 20 minutes. Add dill, salt and pepper to taste, and cook about 10 more minutes. Serve with crumbled feta on top and a slab of really good bread. I’ve used beans in place of eggs and oils in baking, usually “add one can of pureed black beans to a brownie mix”, does that count as a bean recipe? I’d love to know some more baking recipes using pureed beans for the same thing. I have a lot of dried beans, not canned, and I try not to used box mixes as they have a lot of ingredients that I can’t pronounce… and they’re just never as good as making something from scratch. St. Louis for the book tour! This is what I’ve silently been chanting whenever I saw your posts mentioning the tour. And now it’s added! And at Left Bank Books, which is the only place it should be. My cooking buddies and I will see you there!. Laura — Skip the parsley if you’re not into it. Sabine — I don’t have one go-to brand; I’ll either buy DeCecco or look for something imported because I’m a sucker for the texture of bronze dyes. Robin — Yes, a typo, thanks. Love the celery leaves idea. Thank you for the vegan friendly recipe!! I have been a long-time follower of your site, and recently started experimenting with veganism because it feels amazing. You’d be surprised at how many amazing things you can eat that are vegan, like this awesome recipe! I love Heidi Swanson’s white bean, potatoes, and cabbage dish, the one on the cover of Super Natural Every Day. The beans and potatoes are wonderfully crispy and I usually finish it with balsamic and parmesean. Your cassoulet (yeah I add the sausage on top) is another favorite! I like white beans with lamb…one night we had lamb brochettes with grilled veggies and a roasted garlic/white bean puree. For lunch the next day, I put everything in a quesadilla with feta cheese and ate them with a yogurty dip. So good I may make everything again just to put in quesadillas. This sounds like such a hearty, yummy dish. I love simple flavors with big impact like this! Going to have to try on a chilly night sometime soon! Hi Deb! My husband taught me how to make an awesome white bean curry that can be made with either lamb or skinless chicken thighs. It’s a soup to serve over rice with a slice of raw white onion on the side. Soak and simmer beans until cooked, throw in some lamb or chicken, lots of madras curry powder, tomato paste, salt, and simmer until done. It’s middle eastern, and DELICIOUS!!! Awesome with tabbouleh! Lidia Bastianich’s white bean dip (on every table at Becco’s) is the stuff of cocktail party hostess dreams! White bean cakes, make very small with all the yummy additions your mind will do better than mine, serve warm off the griddle with (aghast) ketchup. A meal for all the ages. You need oozing cheese and bean empanadas, a big favorite; one of those the whole is better than the sum of the parts deals: http://recipes.stevex.net/recipe/oozing_cheese_and_bean_empanadas. I always make it with the jack cheese. Your pasta looks incredibly inviting! Red beans and rice is a Cajun standard. Their trick is to (over)load the dish with spices. And I noticed that you don’t have any Cajun recipes on the site! It might be worth a try. The food network has a good recipe on their site, which utilizes red wine vinegar for a nice tang. The mashed beans work almost like mashed potatoes, but (dare I say it:) better. This plus the steaks (and my addition of spinach sauteed in the hot pan after the steaks are done) is a super quick meal that my husband and I love! Oh my! We’re soul mates. I love beans–especially white beans. My favorite thing to do with them (among the many) is just a basic dip: white beans (1 can to 1 clove of garlic), pureed in the food processor; olive oil to desired consistency; white wine vinegar and salt to taste. For what it’s worth, I didn’t feel like this (the original Bon Appetit recipe) made that much. Three of us devoured it with no leftovers. Olive oil, garlick, swiss chard, white beans. Saute, add a cup of chicken broth with 1-2 teaspoons corn starch and lots of balsamic vinegar, salt and pepper and eat with chuncky, toasted bread. You can pair it with grilled veal, pork, lamb…add the grilled meat to the veggie mixture so they can boil a bit together to blend the flavors….it’s heaven. This is just the dinner I’m looking for. Definitely making this next. One of my favorite ways to eat beans is Heidi Swanson’s pan-fried white beans and greens http://www.101cookbooks.com/archives/panfried-corona-beans-kale-recipe.html I fry mine in clarified butter, soo good! This pizza by Chef Chloe is awesome! Minestrone is also a good spot for white beans. I use a recipe from For the Love of Soup by Jeanelle Mitchell, a book that has never led me wrong. So… Michigan? There’s so many of us here that want to meet you! Especially young chefs like me :) You’re an inspiration; it’d be AMAZING if we got to meet you! I made a cassoulet yesterday. I suspect it is delicious today. Just heard you on the Food Schmooze on NPR in CT–the best part about Wednesdays. I’m so glad you and Faith chatted, and I hope she has you back! You were great, I wish you could have talked more. Deb, or anyone else – this sounds great, but if anyone could tell me what is meant by ‘little white beans’ it would be very much appreciated. It sounds like the recipe is calling for something different than cannellini or great northern white beans. Just want to know what to look for at the store. Could certainly use some of your love, attention and expertise!! Deb, I’ve made so many of your recipes and always loved them — it’s a privilege to be able to help YOU out for once. If you like small white beans, this is your recipe. Deceptively simple, but ohhhhh so good! I make a yummy dish called Moroccan White Beans. Love it! Even my husband, an avowed carnivore, can’t get enough of this spicy, meatless dish. Thanks for your recipe. We’ve sort of fallen in love with white beans lately, too. Deb, I’m crazy for beans too. My friends and I put together an order for Rancho Gordo beans about every 6 months to share the shipping costs. We’ve sometimes collectively ended up with about 30 pounds of beans. As for other places to use white beans, a favourite of mine for this time of the year is the cabbage and white bean dish in Heidi Swanson’s Super Natural Every Day. It’s simple and totally satisfying with the sweetness of the shallots and salty kick of the parm. And there are itty bitty cubes of fried potato in it too. Hey Deb, I wanted to congratulate you on having your book selected as one of the contenders for Food52’s 2013 Piglet Tournament of Cookbooks. I was wondering why you weren’t one of the judges and then saw you were one of the contestants. The company you’re with speaks volumes about the quality of your cookbook. Wishing you all the best. You may have had this, as I know you have Russian family, but if not, lobiani – Georgian bean-filled bread – is delicious. It’s made with mashed kidney beans, usually, and Georgian herbs and spices (cilantro, fenugreek, cumin) but I’ve had in mind the idea of trying differently spiced versions with different beans. Very much in love with your white Staub! :) I have that same size in the deep red color and it is one of my favorite kitchen tools. This recipe sounds delicious! Several combinations of veggies and beans, in a small amount of sauce/gravy/liquid work for me. They are more curries to my mind (that very confusing word), rather than soups or stews, and can be served with rice, pasta or (possibly Indian, possibly thin) flatbreads. Cauliflower/Broccoli and red kidney is a good pairing, cabbage and chickpea is good too. The sauce can involve preserved lemon or tomato, but if the veggies are roasted with garlic and lemon zest, I may skip the sauce altogether. My sister needs to patent her garlic, (frozen, non-dry) coconut and tomato gravy. Excuse me if this has been suggested by others, but what about a traditional French cassoulet? It can be quite time consuming to make, but the results are well worth the efforts with beans, chicken, and sausage. A wonderful crowd pleaser and great for a cold winter’s day. I just checked out your book at my local library – and have been pouring over it all afternoon. It’s a REALLY great book, and you are so down to earth, and seem to cook just like me! It’s totally refreshing and I can’t wait to get started on some of the recipes! Yes! You added Salt Lake City to the tour! We shall meet yet! With the very finely chopped vegetable and pureed bean mixture, this is a bit more interesting than I thought just from reading the title. It sounds great! Deb – each year our company sends out a holiday greeting card with a list of books for our customers and business associates to select a gift from. I suggested your book for the list and it has been the #1 choice. Can’t keep it in stock and it’s back ordered from the publisher. It’s the hit I knew it would be from years of following this site! I adore beans and I know others have suggested it but they are more versatile than soups, salads, hummus, etc. Chocolate cookies (with black beans)!! I am so going to try this recipe!! Katie who asked about substitues for rosemary: of course there isn’t a real substitute, but I think a good flavor with this recipe would be fresh sage, or perhaps oregano. But fresh would be key; dried wouldn’t work. If you want to do dried you could do thyme, which is more intense dried than its fresh counterpart and I LOVE with beans and pasta. Deb – have you done cassoulet? The way I do it is basically LOTS of white beans, good sausage, lots of garlic and onion, and a bread crumb crust on top and baked. It is fantastic. I’ll most likely use Penne Regate pasta for this dish, as the texture of the sauce will work with it, or perhaps Farlale (bowtie) pasta would work too. Yum! I’m sure that if you could incorporate these ingredients into a bean burger it would be equally delicious. Pass me a spoon! I could eat that all week long. A staple for me is white bean dip…really simple. Whirl a cup or two cooked in a processor with a few cloves of garlic, s&p and a plash of olive oil and some acid…lemon juice or pepperoncini brine I like best. Done.Dip with vegs or on crostini with some roasted red pepper…maybe anchovy.Sometimes I use it to moisten a falafel/pepperoncini sandwich. I don’t know about white beans, but beans in general can benefit from simmering with rosemary, a little cream or milk if you want, and some diced prosciutto. It’s a little cliché, but it’s bean-lover’s paradise. (I’m no bean-lover, but so I’ve heard.) Thanks for the great ideas! If you ever make ratatouille (or you probably know other kinds of vegetable stews that would work), mix a cup or two with an equal amount of the cooked white beans, spread this mixture in a gratin dish, top with breadcrumbs or panko mixed with parmesan cheese, fresh parsley and a little bit of olive oil, and bake until it’s hot and bubbly and crisp on top. I learned this from a sidebar in Fine Cooking, and it’s simple and lovely. I really like this creamed polenta with white beans and spinach. I add bacon because, well….it’s bacon. I love to mix white beans, tuna, red onion and kalamata olives with some Balsamic Vinegrette. Serve over salad greens. Soooo good. Here’s another suggestion for white beans. I absolutely love The Bean pizza from the Boston-area restaurant Stonehearth Pizza. They top a pizza crust with garlic oil, white bean spread, fresh mozzarella, sliced red onions, pesto, and fresh spinach. It is delicious! I made a similar dish once in about 25 minutes by using a naan as crust. Yum. makes me want it right now. My daughter, a vegetarian, has a “go to” meal she loves summer or winter. She uses canned white beans, garlic mashed, olive oil, sea salt and rosemary sprig sautéed together until hot. Then she toasts slices of day-old baguette and tops with the fragrant beans. It’s her version of beans on toast, and we always have the ingredients around. I’ve made a quite similar white bean sauce for pasta. Its also very delicious on homemade pizza with white soft cheeses and a green such as basil or spinach as a topping. I also make a white bean dip with rosemary, olive oil, and garlic. I tend to call it “rosemary garlic dip” so guests are a bit more inclined to give it a taste! This looks so insanely good, I’m not entirely sure what to do with myself until tomorrow to cook it. As a picky eater/vegetarian/doesn’t like cheese, this just sings to my soul. My favorite thing to do with beans, usually cannellini, is to saute a bit of garlic in some oil, then add beans and vegetable stock and whatever herbs I happen to have on hand, usually a fair amount of thyme, and serve the beans (sans liquid) on toasted slices of baguette. Then, cherry on top, a side of braised baby bok choy. Yum. Mad Hungry-Winner,Winner, Chicken Dinner. Change the chickpeas for white beans. Very good and easy to do. I would sub chard or kale for beans. Mixed nuts and craft whisky is a good winter meal too. I made a spectacular white bean soup just last night… and this one will have to use the rest of the beans this weekend. Also, I just got super excited that you’re coming to Raleigh… and then my heart broke to pieces because I just scheduled a work event for that night! I hope you’ll happen back this way again one day. My dad had a bean pie (kind of like a pumpkin pie) at a restaurant once…but he said it wasn’t very good. Maybe if they had added some chocolate and bacon it might have been better. Any chance you’d give Montreal a second day and stay for Feb 10? B — Sorry, but there’s just one event. They keep me on a tight schedule! This recipe looks amazing, but I am writing to document a sad development in my relationship with you and your blog. I am a few years older than you and while I have loved your blog, both cooking and personal life, for many years, the typeface of the text just keeps getting smaller. And smaller. And smaller. I would prefer to blame this state of affairs on YOU, but unfortunately it’s all about my aging eyes and the ever more powerful reading cheaters I pick up surreptitiously at the drug store. So today for the first time I increased the font size of your blog and it’s really awesome actually :) I can’t wait to meet you on the 1st in St Louie! Speaking of white beans – I recently made your pancetta, white bean, and chard pot pie (sans pancetta) and it was out of this world delicious. Seriously, amazing. We’ll try this one soon! Can’t wait until the Brooklyn event! I’m just trying to figure out what to bake for it. In the meantime, I’ll have to give this pasta a try. YUM! hi deb! i made the same ditalini recipe this week, and LOVE the idea of white beans instead of chickpeas. almost as much as i love the idea of a similar recipe with less dishes – holy cow that was a kitchen hog!! One of our favorites is from Deborah Madison – white beans and kale on toast. You rub raw garlic on the toast, pile it with your white beans and braised kale or mixed greens, and then drizzle olive oil and sprinkling of gorgonzola or parmesan cheese if you have it. Amazing. Simple. Perfect. Another variation we love is to put the kale and beans on brown rice and then top with a fried egg. yum. Pasta e fagioli, classic italian peasant dish. saute onions, garlic, and roasted red pepper flakes in some olive oil, add a can of diced tomatoes. put in a couple of cans of white beans (and all their bean goop), or cooked beans and some of the liquid, then throw in a bunch of cooked pasta (elbow macaroni or the like). salt/pepper/olive oil as needed. the result should be a thick, hearty, stew like pot of goodness. my childhood! How about the Chinese buns stuffed with a puree of red beans, sugar and lard? Classic dim sum! And, the Mexican refried beans, best made, IMO, at home with small pink beans, often called pinquitos. Beans cooked until soft, drained (save a bit of the water), pureed–or mostly–in the processor, adding in water to taste. Cook in “some” lard until the taste and texture suit you. Needs salt at some point. I love white beans! I recommend them in any pasta dish (with chard and tomatoes, broccoli rabe, kale, or fennel). Most recently I made Mark Bittman’s bean burgers with white beans and cajun spice mix (cajun spice mix: not just for the best fried eggs ever). When left to my own devices for dinner, I may or may not have eaten a bowl of just white beans with garlic, lemon juice, olive oil, and whatever fresh herb I have around. You can use any bean in a falafel or panfried patty. Indians mostly do this with a dried green pea, with mint chutney on the side. You might also be interested in Indian uses for bean flour – pakoras, crepes, kadhi. dosa/idli mix bean and rice flour, but cheela is more pure bean. The normal bean flour is besan, or chickpea flour, but you can buy other bean flours or have them ground. On the Italian end, what about socca? PS – Not my favorite, but Indians also make a fudge type dessert out of beans; besan ladoo is gluten free. I can’t wait to make this! I make a pasta with white beans, roasted tomatoes, garlic, and fresh basil during the summer and it is really delicious. White beans and umeboshi. What it lacks in color it more than makes up for in flavor. This looks fantastic. I hope when I get Spoonacular finished (I’m a big foodie and I’m working with my tech-savvy boyfriend to start a recipe search engine) you’ll let us feature some of your recipes! I love that this is super filling with all the creamy beans and pasta going on there. Totally agree about finishing a pasta dish by dunking the pasta in the sauce. I almost always do that because I want my pasta to taste of something! So many new eban recipes to try soon! Sounds great, will definitely have to give this one a try! Ive been on a big bean&lentil&chickpea-kick since I left home cuz my parents (and siblings) dont like them. What really set me off there though were these Anatolian stewed white beans I had in Istanbul a few years ago…The place I had it has been making the same thing in the same spot (in what looked to be the same pots ;) for literally several hundred years and thus was by FAR the best Ive had it, but Ive been working from recipes on almostturkish.blogspot.com and havent been disappointed yet. Id love to see what you could do with some of them! The garlic-vinegar drizzle, as weird as it sounds, definitely gives is a really interesting and unique flavor that I love. Carbs on carbs? Sorry, but I’ll pass. I love black beans, cooked with cumin, garlic, coriander and chilli and stuffed with a handful of cheese and some peppers and onion in a quesadilla. I would eat this every hour if I had the chance. Erin – Beans are a legume. They’re about 25% protein, and half their carbohydrate value is from fibre. They’re no more a “carb” than a tomato is a carb. Comfort food = a large pot of well seasoned beans, any kind, hot corn bread and a glass of wine. What more could anyone want? Leslie: It appears to me that any small white bean (Navy, Great Northern, or Cannellini) could be used with equal success. Just select the one you prefer. One of our favorites we call Truck Stop Beans. Soak overnight, cook with onions, celery, ham hocks, others seasonings as desired. After the beans are cooked, drain juice and reserve. Mix a can of diced tomatoes, tomato paste and 1/4 – 1/2 c aprx. bean juice. Taste the broth and season to taste. Put into a 9 x 12 casserole dish. Place bacon on top, cover with foil and bake at 350 for 30-40 minutes. Yummy, yummy served with cornbread. I just love your blog and shout out in USA Today last week! Oh my God! I love white beans too! Actually I love beans of all kinds! I was always that weird kid eating more beans than french fries or chicken nuggets. My go-to use for white beans is to puree them with a bit of olive oil and lemon juice and then add them to drained canned white albacore tuna instead of mayo! It is heavenly spread on top of some warm crusty bread. I highly reccomend it! My favorite use of beans is in a dish called “kande” – it is a Tanzanian dish of beans and feed corn – or what we eat here as hominy. This was my favorite dish as a Peace Corps Volunteer. To make it, take equal parts dried bean (kidney or the like) and dried hominy. Cover with water and cook until tender (I like to use my crockpot) – there should be really no water left. In a skillet, saute a thinly sliced red onion and salt generously – cook until the onion is really brown. Then add one sliced, chopped tomato – and cook until the mixture is a soupy, tomato goop. Add this to the bean/corn mixture. Also add coconut milk – either fresh or from a can. Stir, add more salt to taste – and enjoy. It is hearty, and oh-so-delicious! You have solved tonight’s dinner dilemma–I have everything on hand and this looks delicious, as well as healthy! Thank you. I can practically smell this dish from here. That finishing oil is brilliant. I love rosemary and recently made a rosemary maple syrup for french toast. Fresh herbs are the bomb. This looks delicious! I wish I had put beans out to soak today. Maybe it will be tomorrow night’s meal. Nothing like an easy, healthy meal for a Friday night! When I was in Greece a few years back with my siblings, we were constantly trying to order enough vegetarian side dishes to sate my non-meat-eating sister. We both fell in love with fava, which is basically a mashed bean dish. They make it with yellow split lentils, I think, not fava beans as I originally had thought based on the name (tricky). I don’t see why you couldn’t do a version of it with any type of bean though! Just google “greek fava”, you’ll get a bunch of different types of recipes. Related, but not quite the same as the other suggestions, my favorite way with white beans is “Tuscan Baked Beans.” There are lots of recipes available on the web, but it’s basically a casserole of onions, beans, garlic, tomatoes, olive oil, with some crunchy breadcrumbs on top. Like a vegetarian cassoulet. It’s a wonderful thing to make when it’s cold outside and you want a reason to keep the oven on for a couple hours. Deb, I think this is the first time I’ve commented but I love your blog. It truly inspires me. Thank you for this recipe and for the pasta-making tips. I’m trying to get to the next stage in my relationship with pasta and I can’t wait to try this. You said you loved artichokes and white beans, so what if you combined them? I’m thinking of the classic warm spinach-and-artichoke dip but with white beans instead of or in addition to the spinach. I literally just made this idea up in my head so I have no idea if it would be good, but it sounds good to me — artichokes, white beans (some slightly mashed, some left whole), lots of flavorful cheese and garlic, pooled with olive oil and served with big hunks of bread for dipping. White bean burger patties on a bed of arugula, roasted red peppesr, roasted eggplant and pesto. those little white beans are great with half-dried tomatos, combined with some garlic and olive oil. and if you don’t have half-dried tomatos at hand, a can of cut tomato cubes will do to. little white beans and tomatos – a unique combination. First, am I hallucinating, or is there something written in the spoon in the lead photo?! Second, this dish looks gorgeous. Just the kind of thing I’m in the mood for these days. Filling, hearty, and nutritious without being heavy. It’s definitely on my must-make list. I made this recipe from Finny Knits at least once a month. It’s so delicious, easy, and fulfills two loves for me–kale and cannelinis! I made this last night. I love pasta and beans and this just sounded amazing. It did NOT disappoint. I’ll admit I was a little skeptical that there was no Parmesan (pasta w/out parm?!) but it definitely stands on its own. This is a winner! Thanks, Deb! I know white bean hummus has already been suggested, but there is a white bean spread in Super Natural Every Day by Heidi Swanson that is lovely with lemon and olive oil and rosemary. I eat it by the spoonful when I make, ahem, a few too many white beans. 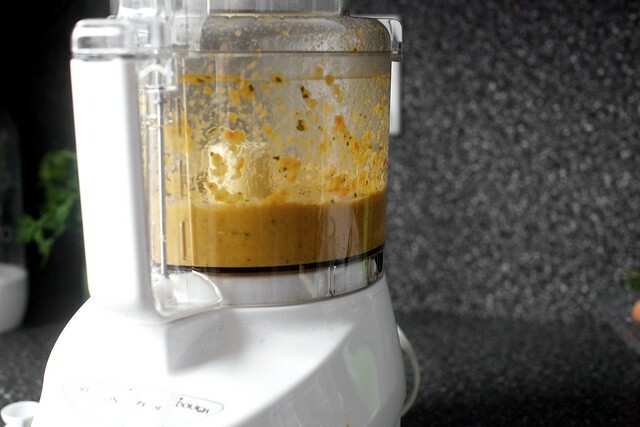 It works well in the food processor or with an immersion blender if your only making a little at a time. Thanks for another great recipe! I made it with 1/2 box pasta and 1 can of canellinis, but kept the originial measurements for the sauce (using a bit less water), and it turned out great. And I’m excited to try this recipe! Thanks! White beans are a favorite of mine for replacing flour in fudgier baked goods- they make a great brownie or cookie cake base. HI Deb, I’m trying your recipe, but the sauce has come out watery.I pureed the beans but they are now drowning in the rest of the liquid, should I let it simmer some more? Also asking if cannelini beans are acceptable in this recipe? I’m not sure if someone has mentioned it, but Nigellas white bean mash makes a regular appearance at our house. Warm some chopped garlic, rosemary and lemon zest in a bit of olive oil. Add your drained beans and mash them together. You’ll need to add a bit of water to make them loose enough, like mashed potatoes, and finish off with lemon juice. Serve as you would mashed potato -alongside steak, sausages, chops or chicken, with a salad on the side, and a super quick and easy dinner is served. Or you can make it even looser with some pasta water, and stir through pasta. It makes for a really ‘creamy’ sauce without all that fat! Add whatever green suits you -we like broccoli and peas, with or without chicken. I’m not really a beans person, but this looks so good! White beans smooshed up with a can of tuna (add some chili powder and cumin) makes a great crunchy taco filling! Hi Deb, it looks soo good can’t wait to make it. BTW loved the lentils, kale and sausage from earlier. I love Smitten Kitchen! p.s. I am the proud owner of your cookbook. Any book tours scheduled for the Chicago area? Deb, I share your obsession with both white beans and artichokes! My favorite thing to eat–which I make at least once a week–is pretty much an elaborate Mediterranean salad. Simmer beans in 1 clove garlic and olive oil, with other spices as desired.Add artichoke hearts and chopped tomato. Cook a hearty grain separately, like farro, couscous, or quinoa. When cooked, toss the grains in the beans. Add olives, red onion, lots of lemon juice, and fresh greens like arugula and herbs. Garnish with feta cheese, if you’d like, and lots of fresh pepper. It’s delicious hot or cold, but not at room temperature. Mm… looks so good! This could make a good soup too I imagine. 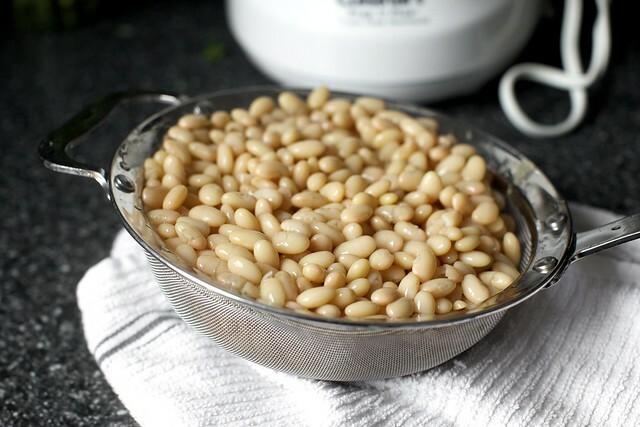 Since you mentioned you are on the lookout for other recipes for white beans, here is a link to the website of the Ontario White Bean Producers: http://www.ontariobeans.on.ca/recipe_list.php . I made their snackin’ bean cake and really liked it! I make a Greek Panzanella salad with bread, feta, tomatoes, basil, red onion, Kalamata olives, bell peppers, and white beans. The vinaigrette is an olive oil/Dijon/red wine vinegar/garlic mix. My husband goes absolutely insane for it and he’s a 280 lb beast who loooooooves his red meat. Cherry tomatoes work well in the winter and I’m considering making this with some oven roasted tomatoes, but obviously this is the best in the summer with a bottle of cold Riesling. Oh! And our other favorite, I totally forgot, is a recipe found on Simply Recipes. Saute a buttload (actual measurement) of white or red onions in your Dutch oven, add spicy Italian sausage out of the casing (I use turkey), brown it, add a few cloves of garlic, and then two heads of chopped kale. Add a cup or more if needed of chicken or vegetable stock, cover, simmer five minutes, add a few glugs of Balsamic vinegar, and then toss in the white beans. After 2-3 more minutes serve. It’s fantastic. From the bottom of my vegan heart, thank you! FYI, I think there’s an HTML error in your first paragraph — where the words “a couple” are hyperlinked, you seem to have meant to have more words showing as text. I’m with you, Deb beans are the BEST! I love this recipe for white bean crostini http://sweetpaul.typepad.com/my_weblog/2012/02/re-1.html. It’s so yummy. I was also eyeing this recipe for crostini too. http://camillestyles.com/food-2/in-season-kale-white-bean-crostini/. And finally, Although this is technically a soup, mine ended up more like a bowl of beans, grains, and greens. The orginal recipe is for chickpeas, but white beans would work nicely and it freezes beautifully. Finishing it with some of your sizzling oil wouldn’t hurt either. 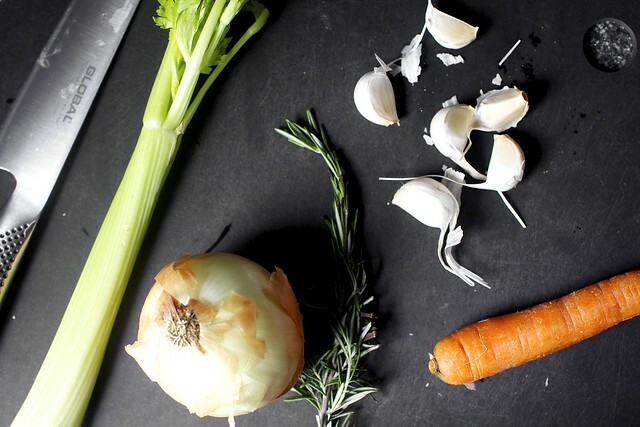 http://food52.com/recipes/20430-winter-warming-freezer-friendly-pantry-cleaning-soup. Thanks for being fabulous, love your website and adore your book! I had white bean hummus last night and it was such a fabulous alternative to butter! You could use up some beans in that :). White beans are so satisfying – perfect for the winter. This recipe looks fantastic! I heard you on Faith Middleton’s Food Schmooze yesterday. Wow — they loved your book! It was a fun interview. There is some text missing at the end of the third sentence. Are there no Southerners in this bunch? The classic, basic, most delicious way of all to eat “little white beans” is cook them in a pot with plenty of broth, with our without a ham hock. Make a pan of cornbread, a bowl of cole slaw. Chop an onion. Split a piece of cornbread, spoon beans and broth over. Generously spoon chopped onions on top, and serve with a side of cole slaw. Divine! Please, please, please Deb, try the beans this way just once! These are the two of the most common ways white beans are served here in Miami. 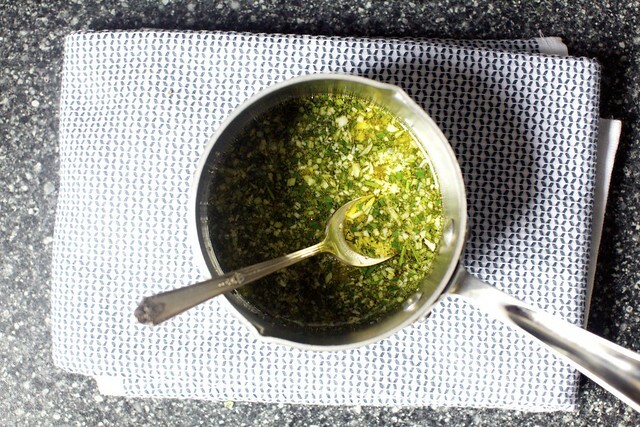 As for herbs to substitute for rosemary: there are Sage, Basil, Oregano, Lemon Balm to name a few that come immediately to mind or you could use http://southamericanfood.about.com/od/saladssidedishes/r/chimichurri.htm since few people have an allergy to parsley. You weren’t kidding – this is an enormous pot of food! I’m home alone this week and made the full recipe anyway, so now I’ve got tons that I can freeze in individual servings. I used black beans instead of white, since that’s what I had on hand, and obviously that changes the flavor a lot, but I really like it! Since it was black beans I also added a little oregano and chili powder to the sauce. This was delicious, thank you! I stupidly mentioned, “Honey, this dinner we’re having is actually vegan,” and of course my husband grabbed the leftover braised pork from the other night, and quickly chopped it right into his portion . . . . Also, as I made the sauce, I thought if it was thinned out a bit it could stand on its own as a thick soup over a hunk of baguette. Yum. I am looking for the recipe from Mark Bittman (?) and others using white beans in veggie burgers. I love GOOD veggie burgers, and I REALLY LOVE the creaminess of white beans. Can someone help? Bittman’s bean burgers – ta da! His veg fried rice is terrific, too – same page. Love your cinnamon raisen bagels…but onto the white beans..Madhur Jaffery has a cookbook called World Vegetarian. It has a recipe for white beans with rosemary. I use navy. I can not begin to tell you just how valuble this cookbook is for any bean lover. The white beans with rosemary is fabulous ! Try it ,you wont be sorry. I fix in iron dutch oven along with turnip greens,brown rice and corn bread and sliced onions. I’ve been working my way through the pasta recipes in that issue of Bon Appétit. I made the kale orecchiette last week and it was beautiful and I made this pasta (with the chick peas though) tonight. I did feel mine was just a tad bland but nothing a good doze of red chili flakes, parmesan and sea salt couldn’t fix when plated. Definitely recommend the kale and breadcrumb pasta dish though! It was excellent. There is always the amazingness of Cassoulet! At last! A new way to use my white beans. This pasta and white beans recipe is very delicious! When I first stumbled across that post a couple of years ago, I thought, hmmn, dill? But then I tried it, and YESSSS. Permanent place in my rotation. Page 268 in Sunday Suppers at Lucques — mussels with white beans and cavolo nero (aka kale) — has become a regular at our place. The superstar bacon occasionally makes an appearance in the dish, even though it’s not in the recipe. But it’s not necessary, and the meal is surprisingly quick, easy, and cheap, with or without it! I have a fabu recipe for Gnocchi with Swiss Chard and White Beans that I got from EatingWell.com. I use it all the time. Very tasty! I am going to give this recipe a try tomorrow… I am a huge fan of legumes and pasta, growing up poor and Italian, my mother made every night’s dinner, pasta and_____ <insert legume or green here! Pasta and peas, Pasta and lentils, Pasta and chickpeas, Pasta and escarolle, Pasta and broccoli, Pasta fagiole – that was all we ever ate! Funny thing is, now that I've grown up, become a very good and adventurous cook (and eater!) I always go back to these comfort foods, and find them to be VERY healthy as well. In our house, my father in law lives with us and suffers from Celiac disease, so cannot have wheat gluten. 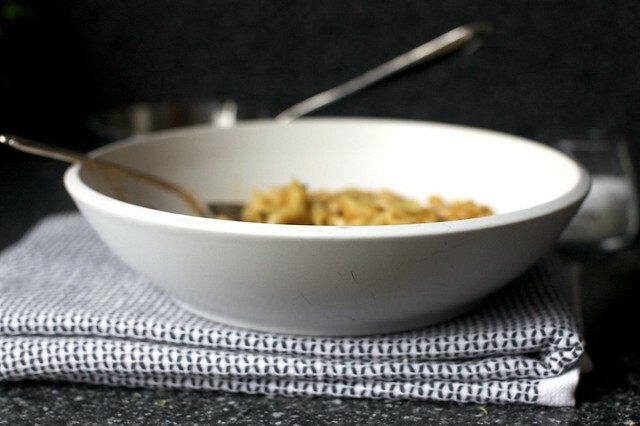 I use brown rice pasta for everything, and it is really excellent! If you cook it perfectly, with an al dente finish, it is amazing. He loves Pasta fagiole, so this looks like something he will adore! Thanks! Looks good. I’m trying this tomorrow for dinner! Oh my gosh, oh my gosh, oh my gosh. This was absolutely amazing. I did add a few shallots, but otherwise, I made this as is for dinner last night for my famil–y and my brothers and husband (who are pretty picky eaters) asked me to double the recipe next time. It was just full of the best tastes!!! Everyone exclaimed it was delicious through moans and full mouths. Olive-oily, garlicky, heat from the peppers… so very excellent. The family consensus was that this is a keeper. I CAN’T BELIEVE IT IS VEGAN! And, I ate the leftovers for breakfast. One of the best bean dishes I have made recently are plantain pancakes. I cook very ripe plantains, smash them up with some cooked or canned beans (red lentils work good but any starchy bean will do). Add in some chiles, cilantro, onion and lime juice. If the mix is really thick I add some veggie broth too (If I cook the beans I cook in veggie broth). Then I dollop the mix into a frying pan with a tiny bit of oil (cooking spray works too). I serve with avacado, tomato salad and lime. I was just in Florence and this recipe reeks of the flavors. My top of my must see/to do list on my visit was buying artichokes at the central market. I paid all of 2euro for 12 beautiful purple artichokes that we later enjoyed steamed with melted butter. The vendor said he would open a shop here when he heard how willing we were to pay for ingredients! I became a rosemary convert on my trip after eating the golden rosemary potatoes. Looking forward to trying this recipe (scaled down for just us two!). Braised gigante beans. Use fava beans for hummus (different texture and flavor from chickpeas, don’t expect same thing). Beluga lentils braised in wine. Lentil salad. I’ve been almost living off this one. Greens of your choice (raab, mustard or turnip greens have been my favorites) sauted with toasted garlic and red pepper flakes, add beans, broth and pasta. Makes it into a soup, but you can add only a cup of broth instead of 4 and skip the pasta. Finish with lemon juice or vinegar of your choice. And I haven’t done it myself, but absolutely make a white bean hummus. White bean and kale pizza. Spread bean paste onto homemade pizza crust. Add kale on top. Salt and pepper. Optional: add mozzarella cheese on top of the beans. Maybe a sprinkle of rosemary. It makes a nice white pizza! Could also be an empanada. I have no other ideas for white beans, because I believe this is the white bean recipe of my dreams. Lurv beans. In dips even more so. And . . .dare I say it. I like them in brownies. I know right. But good. Yes! the white bean spread in Super Natural Every Day that Claire mentioned above is divine! The Nigella Lawson mash is mentioned several times, and I too whisk it with a little water to lighten it (not a part of the original recipe). I always enjoy it with a bloody steak, and with twice as much lemon juice as I’ll serve to everyone else, because I have a sour tooth like that. I made this for dinner last night. Delicious! My family loved it :) I added some vegetable broth in place of some of the water and threw in a little Pinot Grigio I happened to be drinking to deglaze the pan. Mmmm definitely looking forward to the leftovers for dinner tonight. Thanks for another great recipe! I had made your gnocci in tomato broth last weekend, and couldn’t bring myself to compost the strained veggies. Lo-and-behold, I had onion, carrot and celery (celeriac, actually), already cooked with semi-dry (read, can replace tomato paste) chopped tomatoes. I threw them in the food processor, pulled a container of chick peas out of the freezer and cooked it all up. Made the rosemary/garlic oil, and poured over some homemade bread. Of course, celtic sea salt over the top. I make a White Bean, Roasted Garlic and Rosemary Spread for crackers, it’s delicious!!! Best of luck on the book tour! This looks great. One of my favorite recent bean recipes was the farro with roasted leeks recipe from the NYTimes food page (like last week or the week before). I used Goat’s Eye beans (from Rancho Gordo, an heirloom variety) but a white bean would be delectable in that (sort of like a pilaf but really hearty and yum). Forgive me if this has already been mentioned (but I really didn’t want to vet 260+ comments:-); I take cannellini beans, fresh-roasted red pepper, garlic, parsley, cream cheese or sour cream (this varies widely depending on what I have in my house and frig at any given time), salt, pepper, and a bit of olive oil–whir it up in a food processor–stir it into pasta, spread it on crostinis, or dip veggies in it–lovely! oh, I also make bean jam, also sweet, it reminds you of chestnut cream. Soak a pound of beans overnight. Simmer in water with a few sprigs of thyme or marjoram, plus a couple sliced garlic cloves, until mealy but not creamy in texture (how long depends on what bean you’re using, and how old they are; when I use gigondes, I start checking after 35 minutes). Stir in a cup of stewed tomato if you have some, a dollop of honey, a splash of lemon or red wine vinegar, and more thyme or marjoram. Salt to taste. Eat with crusty bread and a green salad. It makes very good leftovers. I tried doing a search on beans here and on google but didn’t find my answer on how to cook dry white beans, and how much the volume would increase? I found some navy beans and white kidney beans at the store (but nothing labeled white beans). I know I need to soak them and then boil them, but just don’t know how much they’ll expand. This reminds me that I have some Rancho Gordo white beans cooked and in the freezer – I’ll have to try this recipe for dinner tonight! It doesn’t look like much, but it is absolutely delicious. I also throw white beans into a minestrone I make that’s loosely based on a Martha Stewart recipe that also uses collards – I’m not usually a big greens fan but I love the collards and beans in this soup. One of my favorite cookbooks: Pasta Verde (Judith Barrett) still available inexpensively on Amazon has vegetarian recipes to please anyone – even meat eaters. You’ll find soups, main dishes, and other delectable delights – many of them paired with beans for that protein component. florets in vegetable broth until cauliflower and beans are very soft; drain. Place in food process and puree until desired consistency, adding hi quality evoo, fresh garlic put through a press, salt and pepper to taste. Nice high protein vegan mashed potato substitute. I can’t wait to make this, I love white beans! One of my favourite ways to make them is to dress them with olive oil, some pomegranate juice, mint, parsley and garlic. I serve that as a main dish, with roasted vegetables with zatar. I adore white beans– during garlic scape season I make an amazing dip that lasts about 5 minutes in my house. I love this recipe, thanks! This was fantastic! I was a little skeptical – we are solidly carnivorous, but this won me over! I agree that the rosemary-garlic oil on top is the finishing touch that put this into the category of “dreamy.” It reminded me a little of the Rosemary Braised beans that a little Mediterranean franchise serves as a side dish. And it wasn’t labor-intensive. In any case – delish! Any sub for the tomato paste? I’m allergic. But everything else sounds AMAZING! One night I made a simplified version of the Lentil and Pumpkin Stew with Roasted Garlic from The New Spanish Table, which I see on your bookshelf, Deb! I kept the key flavors but simplified the process a little. I was trying to use a pot of white beans, though, so I used those instead of lentils. It was so good (and healthy)! I tried it later with the lentils, but liked it so much with beans that it has been one of the few recipes that I have regularly repeated. First LOVE your cookbook. Bought it for myself for Christmas…my husband was a little surprised when I opened it and thanked him ;-). I will be making this recipe pronto. There was a small Itallian place, north beach area of San Francisco that always had old Itallian men (who looked like they could be connected) sitting in the bar. They served amazing food. The original family sold it years ago, it was never the same and it died. Their “meals” came with 7 courses and one was an antipasta course with a marinated white bean dish. Took years, but I finally finessed a respectable copy. 2 cups cooked white beans (a can will work in a pinch if you rinse them, but the texture is better if you start from dried beans. Enough good quality extra virgin Olive oil to cover the beans. Combine all of the above and let sit at room temp for an hour or so. Eat this on good (fresh or toasted) Itallian bread (great sponge for the yummy olive oil), Use it as a dressing of sorts for a salad, great with roasted chicken or just eat it with a spoon. SO yummy……. I followed this recipe to a T however it is more like a vodka sauce. And I mean once the tomato paste was added it became orange. I don’t think I will be achieving the recipe that is photographed for this piece. You cannot discern the beans from the sauce at all? Not sure what happened. I did not alter this recipe since I don’t do that the first time I try something new. i ate lunch in an osteria in arezzo one day a few summers back, and thought i was getting a treat with the black truffle gnocchi. it was the side of faggioli al’ucelleto that stole the show: white beans cooked in tomatoes, with sage and garlic and red pepper flakes and at least one other ingredient i’m still trying to figure out. the beans were creamy with a tiny little bite to them, and they were quite saucy, good for sopping up with crusty bread. so simple, so good. dinner here is often fagioli al’uccelletto, or chickpeas cooked roman style in tomatoes with garlic and rosemary, roasted broccoli or cauliflower, green salad or beets salad, crusty bread and wine. Maybe someone already said this, but Nigella Lawson has a recipe where she uses white beans instead of noodles in a stir fry. It’s called Rib-Sticking Stir Fry in her Nigella Express book. This looks yummy AND for once I have all of the ingredients in the house! Score! Thanks for sharing so many tasty recipes. Is there any problem w/using some veggie stock instead of water/bean cooking liquid? I make my own and always have some on hand. I think it would add some flavor to the dish. I am headed to grocery. I have to make this for tomorrow!!! This looks fabulous! I love the different colorful ingredients you put in there. Wow! I made this today and it was bean-tastically DELISH! This is a great play on the Bon Appetit recipe! I just made it and my husband and I will be eating leftovers for a week! A great recipe to baptize my new food processor, and it inspires me to try and play around with all the recipes I cut out of magazines. I made this for dinner tonight and it was delicious. Thank you!! Normally love all your recipes but this one was a bit of a miss for us. Followed your directions to the letter but I probably won’t make it again as we just found it to be a bit bland. A recipe we enjoy from Epicurious/Bon Appetit 2009 is Sausages with White Beans in Tomato Sauce. I use hot turkey Italian sausage, canned white beans, and throw in a lot of spinach at the end. I think you would like it. I made this last night. It was delish, easy and economical. Pasta and beans are the way to my Italian man’s heart. The rosemary oil added so much flavor. It was genius. this was awesome, deb. served it over gluten free pasta and had grilled shrimp on the side. the maldon sea salt was critical in making the dish. thank you!! it was the beginning to the perfect smitten weekend — made choc sables this am and they rocked! This turned out fabulous. It was a wonderful winter dinner. Perfect for a cold evening to warm up. The flavors melded so perfectly. I served it with some grilled chicken and a salad of mixed greens. White beans are not chocolate but you can’t always eat chocolate. Amazing no one mentioned: cook the beans with garlic, sage & olive oil. Make a stew with baby potatoes, tomatoes & those beans on a base of sauted garlic,rosemary, oregano & crushed red pepper, using the bean broth. Via Anna Thomas New Vegetarian Epicure, 1996. We have even added sausage for large groups of meat eaters. I can’t wait to make this pasta dish, it has me salivating! This was DELICIOUS! (And I got my family to eat Vegan!) Very flavorful and I love how light it is! The rosemary oil was fantastic too! I love pasta and beans, and have been making my family’s recipe for years. While I do love it, this was a scrumptious change from my regular recipe. It was absolutely delicious. My family loved the change. I think the rosemary really gives it a hearty, earthy taste. Bought your cookbook and love it! Love the site and everything about it. Beans are great to incorporate into desserts – for instance, white beans in blondies – unconventional but add a great filling quality. Also, have you ever cooked black eyed peas by themselves, very slowly, until they are silky soft and creamy? Then put in a little salt and butter and eat over a split piece of hot cornbread, like a gravy almost. Bonus points for garlicky cooked greens on the side splashed with vinegar and hot sauce. oh YUM. Also, I make a homemade BBQ sauce (the recipe is meant for leftover meat) in my cast-iron frying pan. When it’s thickened down a little bit and bubbly, I throw in cooked black beans and chunked up sweet potatoes. Put the pan in the oven at 350 for up to an hour, stirring occasionally. Fab with baked corn from the same oven and a really crisp green salad. I do a white bean/fresh bean stir fry with garlic, onions and herbs. I will have to post it sometime soon because it’s really quite good!!! I make a white bean pie that is always a big hit at Thanksgiving. I use navy beans with lots of sugar and spices, and the result is like a more subtle version of pumpkin pie. I got the recipe for it from Epicurious. Actually, the history behind white bean pies is pretty interesting. Its due to come out the end of February, so I’ll have to keep an eye out for it. Have you used English measures for this version? Alex — Nope! That’s the UK edition. It will be out Feb. 28th I think. While the U.S. edition has weights in grams as well, the U.K. edition has (as you noticed) a new cover and is fully Anglicized in measurements (no cups and spoons) and will include alternative ingredient suggestions were needed. More info here. Made this yesterday and a big hit with both the adults AND the kids, one was 18 months old and managed to say YUM, the other a 9 year old that had seconds!! Definitely keeping in the repertoire! Yum! Can’t wait to try this one. Jack Bishop’s Year in a Vegetarian Kitchen has a wonderful white bean and butternut squash and rosemary stew….that’s one of my favorite white bean recipes. So fragrant and delicious. (I just googled for that recipe and found several versions on various blogs, so if that cookbook isn’t at hand it should be easy to find the recipe.) Beans and squash are such a great combo. When are you coming to Montreal!? I would love to pick up a copy of your book and say hi! ok, so i’ve been burned by bean recipes in the past, but this one – dang, it was good. thanks for a super yummy dinner with a lunch or two left over. Dorie Greenspan has a waffle cookbook (WAFFLES FROM MORNING TO MIDNIGHT), which contains a waffle recipe using white beans. Though she crisps them after cooking in the oven to make waffle chips, I eat them straight off the waffle iron. The texture of these waffles is a revelation. Airy, yet creamy. Haven’t made them in years….I think I know what we’re having for dinner. Yummy!! Totally agree about white beans, rosemary, garlic and olive oil! this will go on my meal plan for next meatless monday! Great recipe, I made it tonight for dinner! My boyfriend and I made this tonight for dinner and I couldn’t resist adding chicken and cheese to this recipe (the guy’s a sucker for meat/cheeses). Overall, super delicious and interesting flavors– the rosemary and parsley made for a really interesting dish! Yum! I’m new to your great blog and I found your Perfect Blueberry Muffins recipe (aug. 2010). Well, it is absolutely perfect! The muffins are HEAVEN!! Thank you so much for this excellent recipe!! Whatever way I’ve cooked my beans, I like to poach an egg in them for breakfast. With a warmed-up tortilla. Jeanne — Wow. I pretty much need to do this immediately. Thank you for the idea! In $10 dinners, Melissa d’Arabian has a white bean chicken chile recipe that is to die for! Also Ina Garten has a few different recipes for them in How Easy is That? Personally, I like to make a stew with Italian sweet and hot sausages, white beans, kale, and crushed tomatoes served over rice. The beans really help flesh out the meal allowing me to get fewer sausages. Looks so great! I cant wait to make this. I made this tonight – just added a dash of lemon juice on mine to round out the flavor. Really tasty & super filling! I’m usually the BIGGEST fan of your recipes and follow your site religiously and never comment but for this one I felt I needed to because, as sad as I am to say it…this totally missed the mark for me. Maybe its because I used canned beans, or maybe because my food processor is a bit worn down, but I feel like this dish was a bit bland. I try not to use a lot of salt in my food but felt like this recipe really needed it. I can’t quite figure out what went off…but as I’m tasting it now I can’t help but feel the sauce would work better as a dip or spread then for a pasta dish…any suggestions for making this stand out a bit more before my boyfriend comes over for dinner?? Maybe just some parm will help?? My husband made this for dinner tonight and we loved it! He only used 2/3 of a box of pasta and it was the perfect amount. It soaked up the excess sauce, without making it dry and the flavor was great. Thanks! I made this tonight but started with dried chickpeas leftover from an earlier posted hummus recipe. Delicious. I highly recommend. 2) White bean salad with tuna: couldn’t be simpler, open and drain/rinse a can of white beans, ditto a can of solid tuna, chop half a (pref red) onion, and a bit of rosemary or sage, mix it all together with olive oil and lemon or vinegar to dress, parsley at the end. I really appreciate the recipie. Attractive photos which force me to make it. Its easy recipie for me to make. I am big fan of pasta so soon i am gonna try your recipie. Gratefull to you for such a lovely recipie to share. I loved this recipe for what I would call “Pasta e Fagioli,” which is a family favorite in our house for many generations. I made this version for my Italian husband (who very rarely will admit to liking a dish that is not made in the traditional manner that he is used to), and he also loved it. The addition of onions, celery and carrots gave the dish a heartier taste. 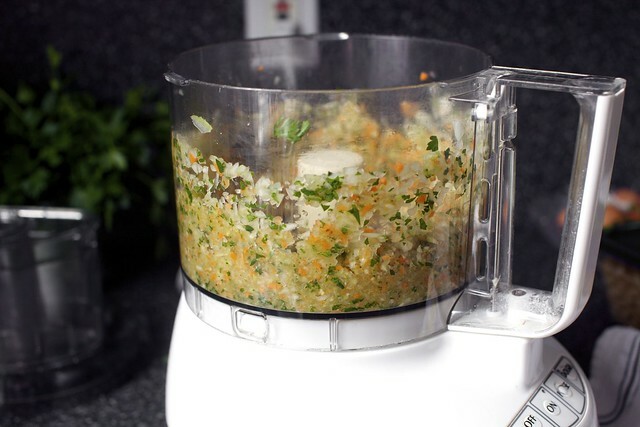 I loved it with the pennete, but my husband said he would like the ditalini better….that is what he always uses. Over the many decades that I have eaten this dish, I have never liked elbows with this. Try broken pieces of spaghetti sometime. My husband also wants me to mention that with chickpeas, try a wider pasta, such as trenette, broken into pieces. I have been on a bean/legume craze myself lately rummaging through old recipes and cookbooks. And I must mention how much I love your cookbook. Already enjoyed several recipes and watching out for your book tour as I would love to have you sign it. I ran home and made this BA pasta dish as soon as I saw it like you! Those tiny little pastas called my name. Like you I thought it was okay, but I wouldn’t make it again. A little funny. I never thought about trying again with white beans. Brilliant! Also, I’m not thrilled about having to use the food processor twice in one recipe. I’m sure you could simplify that step as well. thanks for the love! Honestly, one of the most interesting pasta dishes I have made at home in ages. It contains a LOT of oil, which makes it taste much more like restaurant pasta (which also contains a lot of oil) than pasta that you would make at home. I love the many-layered flavours. Would I make this again? I doubt it. As the authors warned, I reckon I’ll be eating this for the next three months. I just made this – about to enjoy my (first) steaming bowl of pasta now! I used sage instead of rosemary because that’s what I had on hand in the freezer, but I look forward to trying it as written. I normally do not care for beans in pasta because of the heavy, starch-esque texture of cooked beans, so the step of blending up a portion of the bean mixture – a touch of brilliance – really made this recipe for me! Beans!? I like to make vegetarian bbq black eye peas and eat them with cheddar scallion waffles. I got a waffle maker and I’m determined to get the most possible use out of it. This was absolutely delicious! Hubs and I made it last night, and it was soooo good. Definitely one to make again and again. I might add a handful of sun-dried tomatoes to this to punch up the flavor a touch next time as I love both sun-dried tomatoes and punching. Also, for Christmas this year I asked for both your cookbook and the Ottalenghi cookbook, “Jerusalem.” Both are fantastic! Good work with both the photography and how clearly written and easy-to-follow your recipes are. deb-totally delicious. sum is much greater than the parts. toddler loved it as well. passed right by it in BA. much more appealing presentation on your site. Day-after follow-up report: I was cooking for one last night, but made the whole recipe of sauce and set most of it aside so that I can cook the pasta “fresh” for subsequent servings. Just had a little nibble cold straight out of the Tupperware! This sauce is (unsurprisingly, I guess) even better than it was when just cooked. It’s hard for me to believe that it doesn’t contain any cheese – the texture is quite creamy and the flavors are intense. I’m going to share it with my spouse tonight and see if he can guess what’s in it! I just made a big vat of beans last night in the slow cooker, so I can definitely relate! Mixing beans with pasta is one of my favorites — either warm or, when I’m feeling particularly lazy, I cook the pasta and leave all the “toppings” at room temperature, turning it into a pasta salad instead. A perfect one-pot meal! A great mid-winter recipe is a rustic chicken kale stew with white beans. Basically it’s roasted chicken (you can use your own fresh roasted chicken, or cheat with a rotisserie from the store! ), kale, chopped onion, shredded carrot, two cans white beans, and chicken broth. So yummy!! Just made this for dinner and we loved it. Used orecchiette pasta which was perfect because the white beans “hid” inside the pasta. Thinking of you in Montreal tomorrow. We are in Ottawa, two hours east and the snow is blowing. But I hear New York is getting even more snow than Montreal…stay warm! Enjoy your visit to Canada. Just made a big pot of this while I hunker down for Blizzard Nemo. I have no fear as white bean pasta is here! Thank you! Loved this, but next time I’m going to cut back on the pasta some. I halved the recipe and used 6 oz instead of 8 oz and will probably go down to 4 oz next time. But definitely a keeper. Deb, This is great, worked perfect and the kids loved it as well, and it does make enough for lunch the next day! Thanks for posting it! Beans (much like your site) are the best! I make chick pea mashes for sammies, add whatever you want, dill, celery, even juillaned turnips with some mustard or horse radish, that noise is tasty. Also you can fritter bean mashes because fried equals magic. Made for dinner tonight. I halved for husband and I…alas, we ate nearly all of it! I add white beans to The Silver Palate, Pasta Raphael Sauce recipe. It has the artichokes you love as well! Hi Deb. I made this two nights ago. It was a little bland – though the rosemary, garlic olive oil was delicious. I was wondering if you’ve tried this with basil, rather than parsley, to strengthen the flavour? Thanks for posting your recipes, I enjoy your site a lot! I use white beans (canned cannelini) as a base for my salad dressing which is made without olive oil. 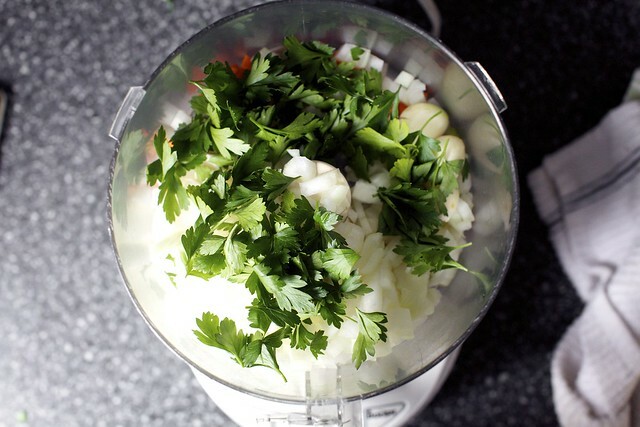 In a blender place one can of beans, a few ozs of one or two types of vinegar, some mustard,a bit of soy sauce, granulated garlic(or clove) ,salt, and blend. I usually double the receipe as I use this dressing alot (or as a pasta topping by subbing out vinegar and add 2-3 large dates). I love pasta and the combination of it with beans, oh its just delicious. Honestly its looking so yummy. I appreciate your recipie and hope try it soon. Thanks alot for delicious recipie. Deb, it’s because of you that I’ve fallen in love with white beans. Your pancetta, white bean Swiss chard stew was actually what I made for Christmas dinner past. My husband and I stayed in the city and decided to take it easy. I’ve since been trying your other recipes with white beans. Thank you! I made this last night and it was SO GOOD! The description of it being hearty and satisfying is very accurate. I used canned beans (and their juice), and chicken broth (as opposed to water). Other than that, followed the recipe exactly, including finishing the pasta in the sauce, which, I couldn’t agree more – makes it fantastic. My 2 year old loved it and it made me so happy, because I knew he was eating the veggies in the sauce. This is a make again staple for sure. Can’t wait to have the leftovers tonight! Because it made so much, I’m freezing a portion – having a baby in April, and this will make a delicious reheated meal when I’m in baby fog. Thank you for a solid recipe! Drench cooked white beans in the pan juices from any roasted meats. My Mom makes a traditional french leg of lamb every Easter studded with garlic and anchovies and cooked on a bed of rosemary and then simmers white beans in the pan juices while the meat is resting. Its one of my all time favourite meals and once a year is never enough, so I started doing the same any time I roast. Adrien — What a great idea. That sounds delicious. Nice idea, thanks for sharing! I wouldn’t have thought about using white beans with pasta but it seems to work very well. This is absolutely delicious! As a vegetarian, I’m so glad to have this recipe for the winter months when I need protein but am sick of chili. I made it with Great Northern beans, as suggested, and using canned definitely cut down on the prep time. As you say, the drizzle with garlic and rosemary practically makes the dish; I was tempted to skip it because I often skip extra drizzles on things that are already well-bound together by a ton of deliciousness, like honey glaze for honey-walnut butter biscuits. Boy am I glad I took the extra 2 minutes! I made the whole recipe and will eat the leftovers for a good two weeks, but have been making a little of the drizzle for each heated serving. It freshens the whole thing right up; no soggy-out-of-microwave-wasn’t-this-great-when-it-was-fresh feeling. absolutely declicious. Forgot the Rosemary oil but still perfect. Don’t wince but enjoyed it with Sauvignon blanc. My partner not feeling well and she especially appreciate the warm hot meal on a cold night here in New Mexico. Delicious all around. Going to make it again in a couple of days. I used tortiglini#20. Holy moly what a treasure trove of white bean recipes! In this vegetarian household, bean recipes of all kinds are a staple. Non-salad, non-soup? Probably my favorite is Martha Stewart’s Braised Fennel and White Beans (http://www.marthastewart.com/281053/braised-fennel-and-white-beans) which she makes as a side to a pork recipe, but we make on its own (subbing veg stock) and it’s to die for. Fennel, white beans, red onion, red wine vinegar, oregano, butter. Yum. I am planning on making this tomorrow, and what I love most about it is that you can probably make it from stuff you already have around. No trip to the store, and if so, only for a couple of things! Deb – just finished the leftovers for lunch (well before spring)! This was another delicious fun dish. I never would have thought of this one. Thanks for expanding my repertoire once again! Deb strikes again!! Thanks for this delicious vegetarian option!! Even substituting with tomatoes and dried parsley it was fabulous! Definitely a keeper. Hi Deb! My husband and I adore white beans, so I made this for us on Monday night. Followed the recipe exactly, except I only used half a pound of pasta — it worked perfectly! We have an olive oil/vinegar shop nearby, so I used their rosemary olive oil instead of the recipe version — equally as tasty. I imagine truffle oil wouldn’t be too bad either! I’m tempted to make a batch of the sauce again and puree the entire thing for a tasty soup like someone else mentioned — oh, for a perfect white bean soup recipe! Many thanks for this one — it will surely be a regular in our kitchen rotation. Whoa, you were not kidding about this making a pile. I used two of my largest containers and they are almost completely full. I probably should have done all the sauce and half the pasta so the pasta doesn’t get squishy, but I couldn’t quite get my brain around that this late at night. This was super yummy. I didn’t get to make the rosemary olive oil, but it was still delicious. – substitute 1cup beans (blended with either 1/2c of a recipes liquid ingredients) for 1c flour in baking for a great textured, fibre and nutrient enhanced dish (e.g in a waffle or muffin recipe calling for 2c flour, replace 1c flour with the puréed white beans). Refer to cookbook by Julie van Rosendaal “Spilling the Beans” for more great ideas. Good dish! Made it for the husband today, who wasn’t crazy about it, partly because my beans (from a can) simply did not get cooked enough. I really missed a crunchy texture and would recommend adding a cup of roughly diced celery pieces when adding the pasta toward the end, if you like that sort of thing. I made this last night for dinner, the only thing I changed was I added a half cup of red wine to the first installment of pasta/bean water to the sauteeing vegetables. I made the full amount so I can have a bunch of leftovers this week. It is phenomenal. I also made the cauliflower fritters…delish! I actually made the Bon Appetite version yesterday. I loved it, but I only had brown rice penne pasta. The pasta effect was definitely wrong. I prefer cannelini beans over garbanzo for something like this. The recipe is a keeper. I have to add that I made two veggie recipes from the cookbook over the weekend, the brown rice kale gratin, and the roasted eggplant that follows it on the cookbook. What a fabulous meal that night. I love this recipe, made it exactly as presented and every thing worked perfectly. Though I may have over pulsed the veggies a bit. My girlfriend was so impressed, I wish I could take the credit :) White beans are my new favorite source of protein. Parsley, onion, red peppers all tops on my list and really helped put this dish over the top. Thank you, thank you, thank you! Just last week I made a white bean parmesan. It was the easiest thing ever — I had some nice tomato sauce, so I layered it with mozzarella and cooked white beans, topped it with grated parmesan and baked it in the oven for about 40 minutes. It was fantastic over pasta. I also put some braised brussels sprouts in there with the beans — not for everyone, but I liked the mix of flavors. Made this for dinner and added the remaining pumpkin puree from the tin I started when I made Pumpkin Cinnamon Rolls (soooooo delicious). Such a great store cupboard recipe and so simple. This would also be delicious with sausage! I don’t have a food processor and so I diced all the vegetables and simmered with olive oil, juice from the beans, water, and tomato paste – delicious! So filling. Capers added some kick as well and cut back on how much salt I needed to add. I know this is a really late comment, but I made this and really liked it, but I thought I would mention that I thought it was even better when I wilted spinach into the leftovers and added a little more garlic. I also cheated and added a very light dusting of grated Parmesan with the oil, but I used less than a quarter cup at the beginning so it didn’t get too heavy. Thanks for another wonderful recipe! I CANNOT BELIEVE HOW GOOD THIS IS. seriously, thank you so much for one of my new favorite dinners. I’ve made it exactly as written, and also with canned beans, whole wheat pasta, spinach, and Parmesan. either way is fantastic. do you think this can taste decent when made with pink beans? that’s all I have in my cupboard right now! I absolutely love white beans (especially great northern)! I’m not a huge fan of warm white beans, but used to eat them straight out of the can (well, rinsed first) everyday as my after-school snack in high school. I’d make white beans with apple and balsamic vinegars, some chopped-up onions, piled onto triscuits. It’s still one of my favorite dishes to this day. I also like mixing canned white beans with barley, celery, and some olive oil for a nice “salad” lunch. And finally, mashed white beans with salt and olive oil on toast. So simply and so tasty! Made this last night and it was oh my god unbelievable! The Mr and I couldn’t quite get over how it uses many ingredients we cook with all the time, (mirepoix veg, tomato paste, beans, garlic, oil) but wound up tasting amazingly new. Like someone said above, I didn’t dream of adding parmesan, which is saying something because I have a real problem with chucking it on everything, even if I shouldn’t!! We are new readers but this together with another one of yours we made last week – the sweet potato, french lentil and swiss chard dish – we are total converts! Stoked that your cookbook comes in an AU edition, and planning to add it to the kitchen shelves post-haste. OH also! We used orecchiette pasta and great northern beans. The way the beans nestle into the curve of the pasta is just too endearing! I made this last night. It’s very good. I just ate some for breakfast because I woke up thinking about it. This recipe was printed and put into my make this soon pile….Well, let me say this, now that I have made it? It is in permanent rotation!! I didn’t even make it ‘properly’ I didn’t want to get my food processor out, so just chopped everything smaller… and meh, no problem. The flavors are the important part…delish. I happened to have some fresh beans, I believe Cranberry, in the freezer so I used them. I believe the finishing oil is the ‘crack’ portion of the dish, I made some extra and then poured that into the leftover container…I must say the 2nd day was super good. My 10 year old Granddaughter said this is now her 2nd favorite noodle dish…that is quite a claim! I promise to use my food processor next time I make it! thanks again for sharing …. Awesome- I did make some small changes- doubled the amount of garlic, used chicken stock instead of water, and added Parmesan on top at the end. The rosemary/olive oil drizzling is key and could really be doubled. A wonderful winter dish! Where did I go wrong? Could it be that my flash frozen white beans were just a tad undercooked so the consistency was too grainy?? Bat7 — Was it the beans that seemed grainy? This was great. I doubled the tomato paste and added some black pepper and fresh chopped spinach at the end. Will definitely make again. Thanks so much for a vegan dish! Another great dish! Instead of using a processor, I used an immersion after cooked veges and beans. It was a wonderful meatless dish (though I’m not a vegetarian). After making this pasta tonight for about the fifteenth time in two months, sitting down eating it on my own and enjoying it so immensely, I felt impelled to thank you – SO MUCH! This pasta (being in the southern hemisphere and having come across it mid-winter) was seriously the best thing that happened to me this winter – it saved me as a fantastic cold weather comfort and is leading me into spring in the most wonderful way. Every time I eat this (and I realise this sounds entirely too passionate) I am reminded how beautiful it is that we have this little thing called life and that that thing just so happens to include food and that that food thing just so happens to be AWESOME. Shouldn’t one of those cups of water in the beginning actually be wine? I’m thinking so..
Doubled this last night to feed a small army of folks. Was fantastic, of course! As others have suggested, swapping 1 cup of water for red wine is a great idea. Made this last night using excess sofrito that I froze from using another recipe. It was amazing even with canned beans. BTW-I love this blog, but the comments that are most helpful are those from people who actually tried the recipe or who have questions. It would be easier to read if people who haven’t tried it or don’t have any new information like other recipe suggestions or questions about the recipe didn’t post so many comments. I’m making this recipe for the zillionth time and thought I’d finally comment… This pasta, with a few tweaks, is the favorite pasta dish in my house of pasta lovers. My three-year-old requests it frequently. The first time I made it I found the cooked parsley to be off-putting for my tastes, so have left it out since – sometimes it makes its way back in the form of chopped fresh parsley at the end, but it’s great with or without. Over time we’ve also reduced the onion a bit and doubled the carrots and celery just to up the vegetable quotient and find it just as delicious. This sauce does make a huge amount, as Deb says, but it freezes wonderfully, so I’ll often make the full batch and freeze half… or eat it on toast, or thin it down for soup. It’s that good. I make this often, it is such a tasty, filling, inexpensive dish. And vegan, but you’d never guess, it tastes so good! I also tend to double the carrots and celery to make a saucier sauce. I use 3-4 T tomato paste, and substitute rosemary for the parsley, so I only have to buy one fresh herb for the recipe. Soooo good! Thanks deb for another great recipe! I’m prepping this for Christmas Eve dinner. Can I make the sauce ahead of time and add hot pasta next day? What a yummy dish. I’m a huge pasta lover but trying to branch out into some meatless dishes and add some things I don’t eat that often (cannelini beans). I will also admit that the leftovers are good right out of the Tupperware they were stored in (feel free the come clean all you closet cold leftover eaters). I forgot the parsley but no biggie. Definitely think using bean liquid is important. Ditalini was my pasta of choice and I do think it is the perfect match for this recipe. Deb, you are a goddess. Thanks again for all the yumminess. I am avoiding tomatoes (and anything acidic for the sake of my baby who has acid reflux). What would you recommend to use instead? I’ve made this again and again because it’s just so delicious! This was delicious on a cold, rainy fall night! I doubled the carrots and skipped the celery (fridge inventory issues) and added some fresh parmesan. I am now counting the minutes until it’s close enough to lunch time to eat the leftovers. Hi! This looks great can’t wait to make it. 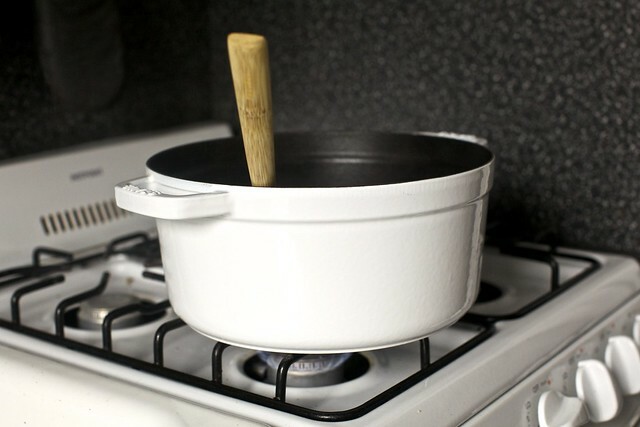 What is the white pot you use? Thanks! Made it tonight and it was delicious, thank you! Made this tonight with white kidney beans I had just cooked and what I had on hand (so no celery, onion, or red pepper flakes). It was STILL fabulous and I’m looking forward to the leftovers! Do you think this could be adapted to Instant Pot? It doesn’t seem like it should be that complicated, my only thought is that the beans might overcook. This was delectable! I made some modifications (no parsley, less onion, more veggies and tomato paste, pinto beans that I had on-hand), and it was clear that this recipe can be modified without fail. So good! Although this should have left much for leftovers with just two of us eating, there was less remaining since we couldn’t stop eating this dish! Made this and enjoyed it! A different sort of pasta than I typically have and I like it…I will try it again, but I’d like more of a kick next time. Maybe more red pepper and parmesan? There has got to be a way to turn this into an instant pot recipe! Oops, apparently I’ve already had this thought. Ha. Even though this is a “winter” dish, I made it today because New England is not cooperating with Springtime. Another excellent dish. My third sk this week. I love that it is accidentally vegan, yet decadent. Keep ‘em coming. SO UNEXPECTEDLY DELICIOUS!! Doubled the carrots and celery, skipped the parsley as well as the rosemary and garlic oil and finished with a bit of parm and a pat of butter! My boyfriend and live in taste tester says “best pasta ever” and I think I agree!